If you’ve built your presentation, rehearsed your demonstration, and notated your revised script, you’re probably feeling like it’s time to start recording. And while your visuals will no doubt speak for themselves, you will actually still need to speak for yourself during the recording. To record high quality audio you need to know what audio tools are available, how to make best use of these tools, and how to listen for problems in quality during recording. In order to achieve the highest quality audio results, it is recommended that you employ a dedicated external microphone. This includes headset microphones and free-standing USB microphones that you can plug into your laptop or desktop computer. Headset microphones and USB microphones tend to be unidirectional, meaning they pick up a very narrow band of audio coming only from the direction they are pointed. These microphones are known both for their ability to isolate sound, as well as their ability cancel out external and reflected noises. You are absolutely welcome to try the built in microphone capabilities of your laptop, but keep in mind these microphones tend to be omnidirectional. Not only can they pick up noises from all directions, but their location on your laptop tends to make them prone to picking up sounds from the laptop, reflection noises, and echoes. To avoid these noises and reflections, set up your recording in a room with few or no windows, little to no fan or air conditioning noises, and a fair amount of acoustic dampening from items such as rugs, carpet, window curtains, cushioned furniture and ceiling tiles. Tip: If you decide to record with a USB microphone, or your built in laptop microphone, mute your computer’s speakers to prevent the signal from the speakers from re-entering the microphone, causing a dreadfully high-pitched feedback loop. Alternately, plug in a pair of earphones for self-monitoring. Once you have decided on your microphone preference, it’s time to cue up the input sensitivity menu on your computer. Depending on your recording software, there may be an input sensitivity meter present. This goes for both TechSmith’s Camtasia (below top) and Apple’s Quicktime Pro (below bottom), as well as several others. Caption: Camtasia for Mac recording setup screen showing audio input selection options and audio levels meter. Select input settings for recording audio. Select the desired microphone input for recording audio. Before recording begins in both Camtasia and Quicktime, users are prompted to check their audio levels. At this point you would do well to check your levels by talking through a few lines of your presentation. Watch the meters to determine if your voice is being picked up at an appropriate level, which is approximately 70-80% of the meter’s visible reading. If your readings appear too low or too high, navigate to your system’s audio input menu in your PC Control Panel (below top) or Apple System Preferences (below bottom). 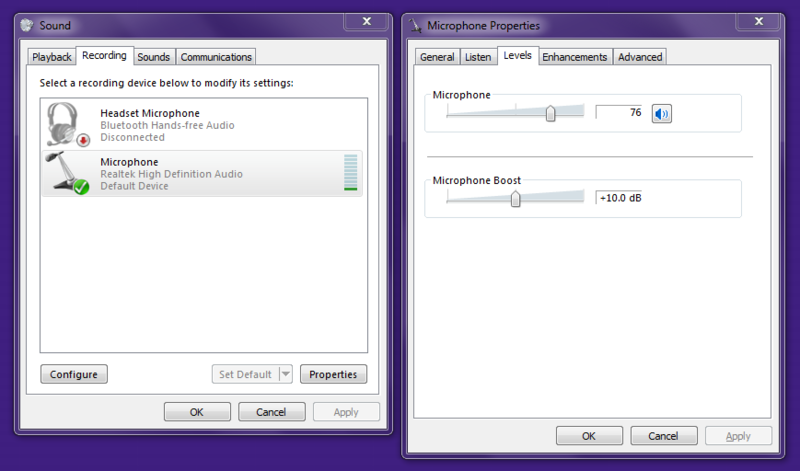 Select the audio input settings and adjust levels in Camtasia Studio for Windows. On Windows, confirm that your desired audio settings are correct. On a Mac, confirm your sound levels and input settings by viewing the audio settings in System Preferences. Next, record a 30 – 90 second segment of your presentation. You don’t need to start from the beginning, just pick any spot. Then, set your speakers to your normal listening level and playback your test recording. If you find yourself turning up your speakers, your input level was a little low or way too low. Of course, if you find yourself scrambling to mute your speakers, your input level was too high. This will often result in scratchy, muffled-sounding playback, which is very undesirable. What do your students need to hear? Most lecturers rely on speech as the primary means of communicating to their audience. Recording your voice clearly helps students comprehend you and minimizes the amount of distracting noise that can detract from the quality of your video lecture and have a negative effect on its perceived credibility. Sound effects can also be helpful when used appropriately. Sounds can provide emphasis or create associative meanings for viewers. When selecting sounds to enhance your video, think about how students may perceive the sound effects; they may find them annoying or humorous instead of effective or serious. If you are unsure about sound effects, it may be best to leave them out, or to test them in a small sample video and determine how students respond. Sounds can add a layer of depth to videos, especially for those who are auditory learners or who have visual impairments. However, those with hearing impairments may have difficulty understanding a video that relies heavily on sound effects and additional closed captioning will be required to describe the sounds. Sound effects, like music, often require purchase or licensing to be used.